Caption slip reads: "Photographer: Mack. Date: 1957-07-30. Reporter: Adler. Assignment: Ammonia victims. 72: Victims L to R: Mrs. Antonia Mirenda, 47, Miss Mary Kapus, 46, and Mrs. Rosemary McKinney, 25 at Lincoln Heights Receiv. Hosp. 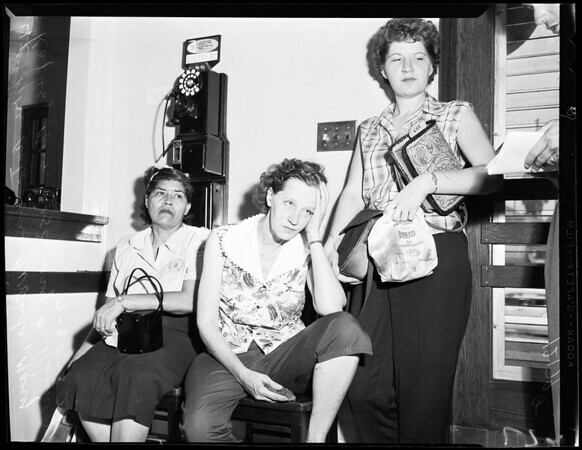 71: L to R Miss Clara Angelo, 26, Mrs. Bertha Sanchez, 18, and Miss Genvieve Paulick, 34, at Lincoln Heights Rec. Hosp. ".